The finished product topped with freshly grated parmesan. Finally got back to the kitchen cooking one of my favourite dishes too! What I love about risottos is that there’s so much you can do with the basic process for the dish. You can come up with very different dishes just by picking a different stock or a different set of ingredients that you mix in at the end to get the taste that you’re looking for. For tonight’s dinner, I decided on a porcini mushroom risotto with a shrimp stock I made from some shrimp heads that we had left over from our lunch. I wanted to try this technique I saw on TV where the chef fries the shrimp shells and heads before throwing them in the blender to really squeeze out all those juices from the heads. What I did for my stock was to start with a basic vegetable stock and then add the shrimp juices in after. I started the stock with the vegetables in one pot. Put in some peanut oil on medium heat then threw in all the vegetables to brown. Mixed the vegetables around for around 5-10 minutes to get them nice and caramelised for extra flavour. Once done, I filled the pot with water (around 2 litres) and left it to reach a rolling boil. Lower the heat to a simmer. Poured some peanut oil in a wok on high heat. Once oil is hot enough, throw in the prawn heads and toss in the wok until all the heads get a nice, bright red colour, around 10 minutes. Turn off the heat on the wok and add in a little vegetable broth. Transfer all the contents from the wok into a blender. Pulse the mixture until fully blended. When done, strain the contents into the vegetable broth and squeeze out all the juices. I usually just follow a basic procedure whenever I make risottos, adding in different ingredients to build the flavour. The quantities of each ingredient will vary depending on the amount that you are making. As for the amount of stock that I use, I usually just taste the doneness of the rice as I go along thus the absence of any “scientific” measurements. Saute diced onions in some olive oil. “Toast” the arborio rice in the olive oil and onion mixture until rice grains are slightly translucent with an opaque centre. Add in white wine and wait until the rice absorbs it and the alcohol burns off. Slowly add in one ladle of stock at a time until preferred doneness is reached, stirring regularly to avoid burnt rice at the bottom of the pan. Finish with butter and freshly grated parmesan cheese. Season to taste. You can pretty much add the other ingredients any time during this process. For this particular dish, I rehydrated the dry porcini mushrooms in some of the shrimp stock and added all of this in around 5 minutes before I finished the dish. 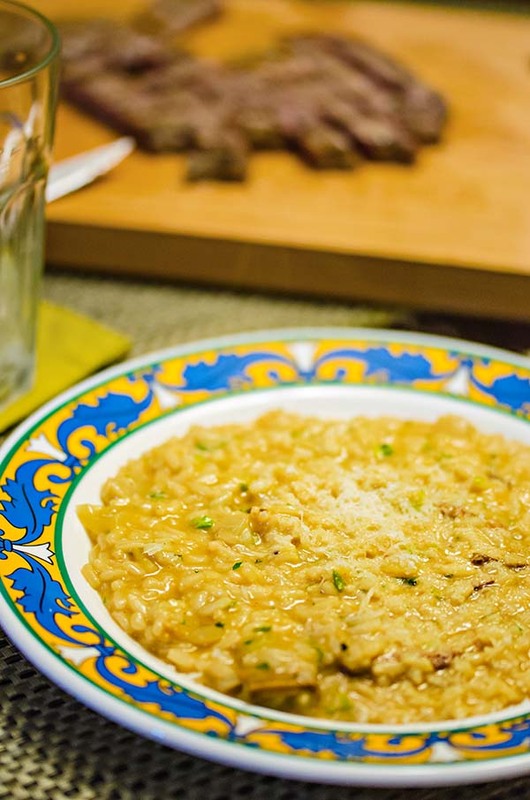 You can use whatever ingredients you want for your risotto. I have used lemon, shrimp, squid, fish, basil, saffron, fresh mushrooms, bone marrow, and a slew of other flavour givers. Just experiment with flavours that you enjoy and you’re bound to come up with a combination that works for you! Thanks! 🙂 Try making one with fresh shrimp, lemon juice, lemon zest, and fresh italian parsley. That one’s always a winner.